Successfully Added UMi Touch Smartphone - Android 6.0, 5.5 Inch 1080P Screen, 4G, 3GB RAM + 16GB Memory, Gesture Sensing (Silver) to your Shopping Cart. 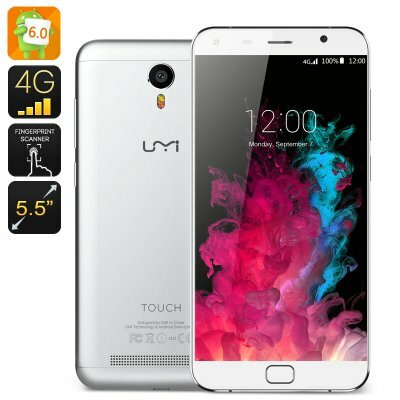 The UMI Touch is a super modern smartphone sporting the latest Android OS - Android 6.0 Marshmallow. The new operating system comes with a whole set of upgrades in terms of design, navigation and performance and with the UMi Touch, you will get to discover them all! Enjoy Android’s latest operating system on a nice 5.5 inch HD screen. The UMI Touch smartphone puts all the newest features at your fingertips - so go ahead and discover! Android Marshmallow comes with improved Quick Settings, a revamped App Drawer, animations, new emojis and more. You can get the latest apps from the Play Store - the phone sports 128GB externally and comes with 16GB of internal storage. After you have studied the new OS in full, go ahead and set up the smartphone’s security — which is easy, fun and efficient thanks to the front facing fingerprint scanner. With it, you will be able to have your private data protected at all times, with no passwords needed. With the MTK6753 Octa Core CPU and Mali-T720 GPU and 3GB of RAM you will have a great setup for gaming, multitasking and smooth performance. The 4000mAh battery offers up to 20 hours of non-stop talk time or around 15 days on standby. The UMi Touch Android 6.0 Smartphone comes with a 12 months warranty, brought to you by the leader in electronic devices as well as wholesale Android Phones..
As per usual, Chinavasion delivers !! Always awesome communication and speedy service....the reason I recommended them to everyone !